Juan Diego Martinez, M.D. FACC, is a Board Certified Interventional Cardiologist. He is also Board Certified in Cardiovascular Disease and Internal Medicine. Dr. Martinez specializes in the diagnosis and treatment of Cardiovascular Disease. Dr. Martinez is a graduate of the University of Texas Pan American in Edinburg. He earned his Doctor of Medicine from the University of Texas Medical Branch at Galveston. He completed his Residency and Internship in Internal medicine at the University of Texas Medical Branch at Galveston.Dr. 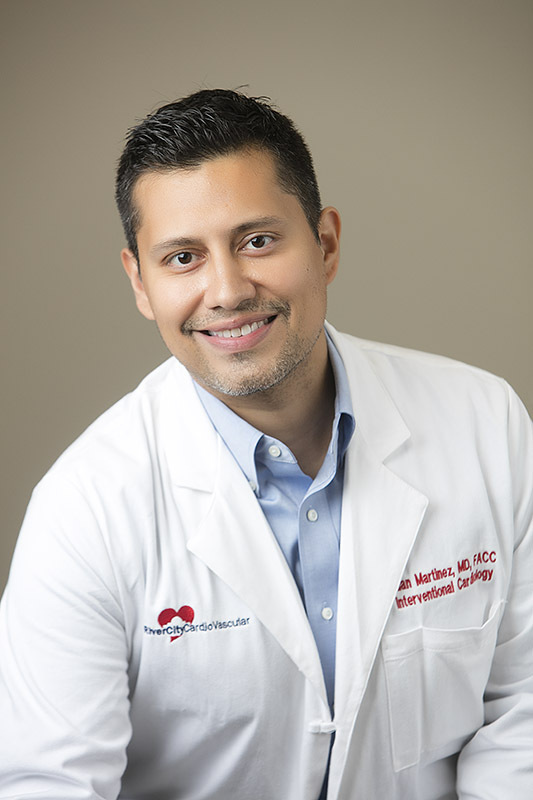 Martinez went on to complete his Cardiology Fellowship at the University of New Mexico in Albuquerque. He completed his Interventional Cardiology Fellowship at the University of Texas Medical Branch at Galveston and at the Methodist DeBakey Heart and Vascular Center Cardiology Program in Houston where he served as Chief Interventional Cardiology Fellow. Dr. Martinez professional interests include focusing on coronary and peripheral arterial disease with a special interest in structural heart disease including heart valve problems and holes in the heart. In his spare time he enjoys fishing with his sons, cooking, watching movies, and spending time with his family. Drs. Martinez, Ontiveros, Christopherson, Frierson, Mokwe, and Magallon are all committed to being San Antonio’s leading independent cardiology practice. For the convenience of its patients, RiverCity CardioVascular provides on-site diagnostic testing including echocardiography, vascular ultrasound and nuclear imaging. The physicians at RiverCity CardioVascular believe in patient centered care and work to deliver the best patient experiences through advanced technology.